Go to the JIRA Administration, click Plugins, then Application Links. Click Add Application Link, enter your server URL, enter the name of your application and select Generic Application. Now configure it: got to Incoming Authentication, set a Consumer Key (I used samplescript above), set a name and paste the contents of jira.pub into the box. 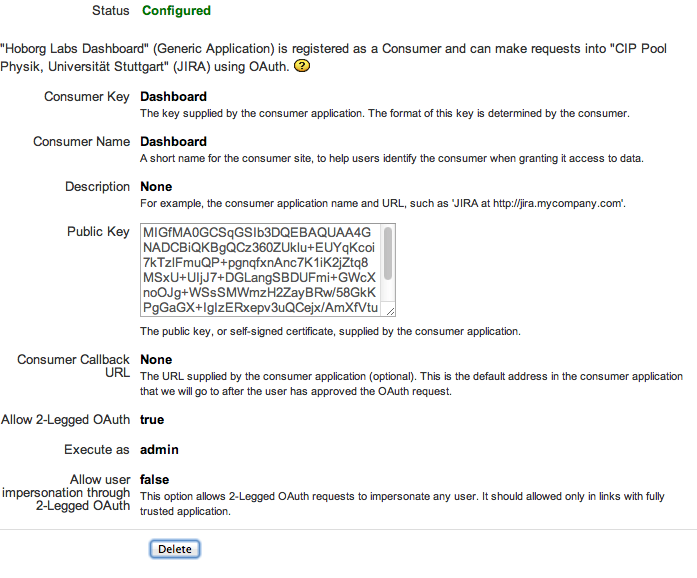 Now check Allow 2-Legged OAuth and enter a user name to which you want to map the key (i.e. which user’s permissions the OAuth client should have). This entry was posted in JIRA, PHP on 2013-04-21 by Michael Kuron. I recently replaced my WiFi access point, an ancient Linksys WRT54G v3.1. I was looking for something that supported simultaneous dualband, multiple SSIDs, and VLANs. I also wanted something that could run OpenWRT. I ended up buying the TP-Link TL-WDR3600 because it met all these criteria and was available for less than 50 €. After using it for a few months, I can definitely recommend it: The wireless coverage is good, it supports Multi-SSID just fine, and the internal switch is fully VLAN-capable (and easy to configure using the OpenWRT LuCI web interface). My only complaint is that in the 5 GHz band (5150 MHz – 5250 MHz), OpenWRT limits me to 50 mW of output power (the Linux kernel has a limit of 100 mW), even though I could legally run up to 200 mW. These lowest four channels of the 5 GHz Wifi band don’t even require TPC (transmission power control) or DFS (radar detection) in Germany, making the limitation completely unnecessary. The TL-WDR3500, TL-WDR4300 and TL-WDR4310 are identical to the TL-WDR3600 save the radio module, so the instructions here should apply to them as well. Hook up your computer to an Ethernet port on the WDR3600. Download openwrt-ar71xx-generic-tl-wdr3600-v1-squashfs-factory.bin and upload it using the factory web interface at http://192.168.0.1 (do not rename the file or it might not update). After it reboots, renew your DHCP lease (OpenWRT uses a different subnet by default) and telnet 192.168.1.1. There, run passwd to set a password, then hit Ctrl-D to disconnect. Now you can ssh root@192.168.1.1. Now you can scp root@192.168.1.1:/tmp/*.backup ~/Desktop to get them off the device. Now you can easily configure everything the way you want it (but please don’t ask questions in the comments about the specific configuration: the OpenWRT forums are a much better place for that). The device will eventually reboot and come up with the new firmware. Your configuration should still be present. If you’ve locked yourself out, it’s easy to get back in: unplug the device, plug it back in and as soon as one of the LEDs on the front starts flashing, push and hold the WDS button. Release it when that LED starts flashing a lot faster. Now, set your computer to a static IP of 192.168.1.x with a subnet mask of 255.255.255.0 and telnet 192.168.1.1. Now you can reset your password (passwd), change configuration variables (uci), or do a factory reset (firstboot). When you’re done, reboot -f to return to the normal operation mode. It is possible to brick your device with OpenWRT. All the commands above are provided without warranty, so use at your own risk; if you don’t know what your doing, don’t do it. Also, it’s not that easy to get back to the original TP-Link firmware (which you would definitely need to to if you wanted to return the device to TP-Link for warranty repair. This entry was posted in Linux on 2013-04-13 by Michael Kuron. We’re running a 2006 Xserve RAID at the university. Our old server was a 2006 Xserve with an Apple 2 Gbit Fibre Channel card. When we recently got a new Mac mini server to replace, we ordered an Atto Thunderlink FC 1082 to interface with the RAID. The Promise SANLink would have been a possible alternative, but the Thunderlink is capable of 8 Gbit/s, thus future-proofing our investment. Unfortunately, when I hooked up the Thunderlink straight to the Xserve RAID using an Apple Fibre Channel Copper Cable, neither the Xserve RAID Admin utility nor the Mac mini showed a connection. After some googling around, it appears as if the Xserve RAID is not capable of negotiating links with HBAs that are capable of more than 2 Gbit/s. Turns out also says that you shouldn’t use their 4 Gbit card with the Xserve RAID: HT1769. Since the RAID has been working fine for quite a while with two HP servers running VMWare ESXi with Qlogic QLE2460 controllers connected through a Qlogic SANbox 5200 2 Gbit FC switch, and I knew the Thunderlink worked with that switch, I simply used an FC Copper Cable between the Thunderlink and the switch and one between the switch and the RAID, configured the zoning, et voilà, the array mounted on the Mac mini. This entry was posted in Mac, Mac OS X Server on 2013-04-09 by Michael Kuron.